Business meetings are conducted to tackle important issues and operations that are critical for whatever business you happen to be in. These meetings, regardless of the scope, can take hours to complete. Many of these meetings go through lunch hour as momentum is lost if there is a stoppage. That is, meetings moving forward at breakneck speeds will not be stopped so people can go grab a bite to eat. No, no way is that meeting going to stall because it’s lunch time, there is that chance that participants will lose their train of thought and never come up with that million dollar idea. This is but one reason to cater business meetings, here are a few more reasons to cater your business meetings. If you are having a meeting with some very important clients or potential clients, we suggest you cater the event. We feel it is of utmost importance that you impress these people as best as you can. You can rely on strategies and deals and other means of persuasion, but we know in order to seal the deal you will have to provide a good meal. Catering services, such as ours, offer a wide variety of foods that will inspire ideas and ways to improve business. That is, nobody ever screamed eureka while chomping on a dry ham sandwich. Good ideas are born from the stomach. Good food is brain food and you will notice a difference in your employees as the great ideas fly off the wall. 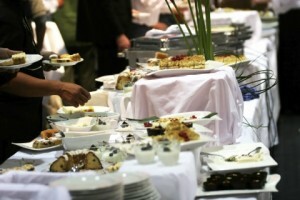 A Catered Affair is Vancouver’s premier catering service. We offer a wide range of corporate menu items sure to inspire anyone. Check out our menu and invite us to your next meeting.